​CALL US TO GET YOUR QUOTE! Have a new home or office in Natick or the Boston MA area? When you’re looking for a new home installation windows for your home or office, it can be difficult to decide what material to choose. With several options available on the market today, a notable choice would be fiberglass windows. It is hard to keep all of the options straight, and to remember the different features of each. Our technicians at Natick Window Company are here to help you through every step of the window installation process, and will answer every question you have along the way! Fiberglass is an excellent material if you are looking for an option that is resistant to warping, corroding, splitting, or otherwise becoming damaged. As with any other window material, it is important to consider the level of energy efficiency of your installation or replacement windows. Fiberglass is a very efficient choice in this respect. Minimum air infiltration and premium insulation options contribute to the efficiency of fiberglass windows, and help keep your heating and cooling costs low. Similar to vinyl windows, fiberglass windows require very little maintenance. Other than keeping it clean, there will be little to no major maintenance needed to keep your fiberglass windows looking like new. There is a significant design flexibility factor with fiberglass windows. With an extended array of color, shape, and size options, fiberglass windows will make a great addition to any home or office space. More than any other window material, there is a high climate durability that comes with fiberglass windows. In both harsh heat and cold temperatures, fiberglass windows will maintain their structural strength and integrity, while keeping the elements out. 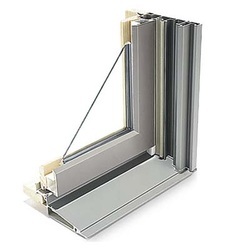 There is virtually no expansion or contraction experienced with fiberglass windows. At Natick Window Company, we want to make sure you are exactly what you’re looking for from any of our window products, including fiberglass installation or fiberglass replacement windows. That means we will work with you to find the exact size, shape, and color of window design that will best suit you and your space. With access to the industry’s top manufacturers, Natick Window Company is the area’s leading source for all installation windows, replacement windows, and window repairs! We are sure to find the right window for you. Our staff will also work with your schedule and budget to make sure that we provide you with the products and services you need, at prices you can afford, and without making you wait for installation, replacements, or repairs! Our priority is customer satisfaction with every window service we provide, no matter how what it may be. We will work with you to create the perfect plan for your residential or commercial windows! There are numerous benefits to installing fiberglass windows in your home or office. If you would like to learn more about the benefits of Natick Window Company fiberglass windows, call us today! ​We can be reached at 508-251-8038, and have staff members standing by to take your call, and to tell you more about how we can help you install the perfect fiberglass windows in your home! Associated Materials Inc.The Atis Group Inc.
Champion Window & Patio Room Co.